Here's Joey, snoozing away in his favorite spot. There's Connie, squeezing in as close to him as she can get. This makes me so happy. First of all, Joey is hanging out with us. If he was feeling sick, he'd be off hiding somewhere. Second, Connie obviously likes Joe just fine. For close to 15 years, Joey lived with Charlotte, my diva girlcat. Charlotte was adorable to me, my majordomo. But Charlotte hated, hated, hated Joey. She just couldn't abide the cut of his jib. Every morning, every evening, day in, day out, she'd slap his head and steal his food. He accepted this with a grave grace, as though being mistreated by Miss Thing was just his destiny. I know Joey doesn't have a lot of time left. But I'm glad that he gets to spend it with Connie, who enjoys his company. He deserves that. 1) Of the various cultures, ethnicities or nationalities you belong to, which most strongly do you consider yourself? I'm an American. 2) Is there a culture you cannot claim heritage from but which you feel quite close to? I'm only 12% Irish (vs. 88% German) but I feel more Irish. I like beer. I like prose. I like green. On the other hand, I'm not crazy about the two world wars my German heritage ties me to. 4) If you could move anywhere in the world and be guaranteed a job, etc., where would you go? England or Canada. I'm not at all eager to leave where I'm at, so I'd want to be where I could get home easily. 5) If you had a time machine, and could witness any one event without altering or disturbing it, what would you want to see? 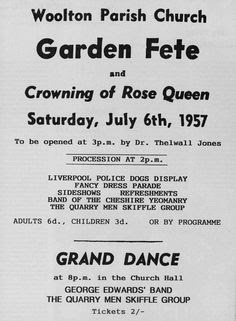 I'd like to attend the Woolton Parish Church Garden Fete in Liverpool. Some guy named Lennon met and found himself impressed by a younger kid named McCartney. 6) Have problems sleeping? Not lately. 7) Are you free with your feelings? My emotions overcome me and splish splash all over the place. 8) What is the one outfit/piece of clothing/accessory you own that makes you feel incredibly good whenever you wear it? Why? This little blue sweater. First of all, it looks good with nearly everything I own. Secondly, I got it at 80% off at Macy's. How can you not feel good about such a deal? 9) What do you do to make yourself feel better when you're in a funk? I respond well to music. It helps to take a shower and shampoo away the sad residue as I sing with radio. 10) Has anyone ever surprised you in a way that let you know you were special? How? Yes. On Thanksgiving, my friend John gave us tickets to all three days of the 2016 Cubs Convention. He's always said some of his happiest summer days have included me and the Cubs. But that's a couple of hours in the stands, drinking beer and enjoying the Wrigley Field experience. I'm very touched that he wants to spend three days of geeky fandom with me. 11) When you are having a "good day," how do you spread the happiness to others? I try to be expansive and positive. 12) What is one thing that puts you in a bad mood, no matter how good you were previously feeling? Bigotry. I cannot be around homophobes or racists or those who discriminate against others based on religion. 13) Would you rather live in a world with or without technology such as computers, cars, airplanes, bombs? I've fantasized about this often. The mid-19th century holds a strong attraction to me. I'd like to give living like that a try if I could use that time machine you mentioned earlier. 14) If you had to live without either heating in your house or air conditioning, which one would you keep? This is a tough one, since as we learned here in Chicago during the 1995 heat wave, hot weather can be fatal, too. Plus, you can always add another blanket or sweater but you can only get so naked. Still, I'll keep the heat. 15) If you had to own five dogs, what kind would you get? Now this one is easy: they'd all be shelter rescues.